Planetary aspects are certain angular relationships between two planets (whether a planet moving in the heavens or a planet in a natal chart). 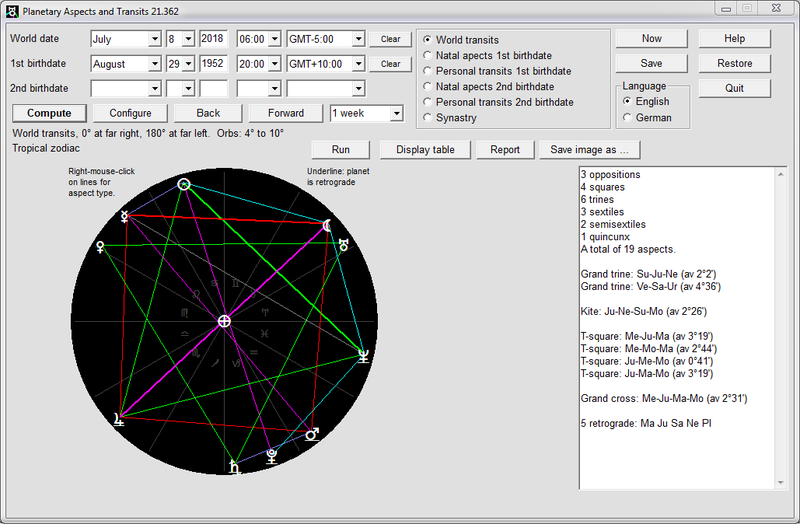 Planetary Aspects and Transits is Windows software designed to help students of astrology (both amateur and professional) to explore world transits (which are periods of time during which two moving planets remain in a particular aspect) and personal transits (which are periods of time during which a moving planet remains in a particular aspect to a natal planet). This program has many user-selectable options, such as the ability to choose your preferred zodiac (tropic or sidereal), set values for aspect orbs, and show only the outer planets (that is, Jupiter to Pluto). 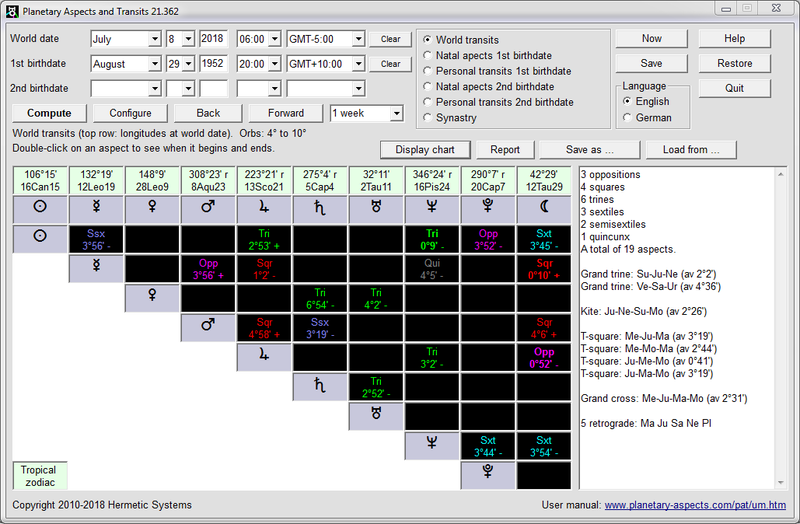 After entering a date and time you can view the corresponding world transits in either tabular or graphical 'chart' form (see examples below), showing how many aspects of each kind (square, trine, etc.) are present, and also if any aspect patterns (T-square, kite, yod, etc.) are present. You can search for aspect patterns from the currently-entered date onwards. 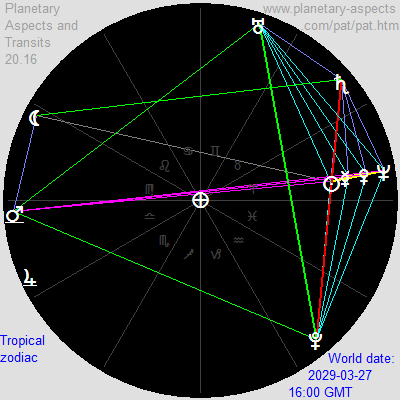 The chart may be animated so that the development of transits can be viewed in steps of a day, a week, a month or a year. You can also enter a birth date and get tabular and graphical display of natal aspects (the horoscope), and for a given date get the personal transits for that date (that is, which moving planets are transiting which natal planets on that date, and how long those transits last). By entering two birth dates you can get the synastry (that is, the aspects which the planets in one natal chart make to the planets in the other). The display of personal transits can also be animated, so as to see when aspects and aspect patterns form and subside for someone born at a certain date. Additional information of interest to the serious astrologer is given regarding when transits start and end, and their duration. In the case of personal transits this information is displayed graphically for the entire course of the transit, showing when the transit becomes exact, or at least reaches a minimum. 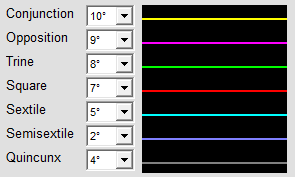 All charts can be saved as PNG graphics files, with either black or white background. An 'r' following the longitude of a planet indicates that the planet is retrograde (in this example, Saturn). An angle value shows difference of the aspect from exactness (so 0°0' is exact). A '-' or '+' shows whether the aspect is decreasing ('-') or increasing ('+') at the date and time shown, or in other words, whether the aspect is applying ('-') or separating ('+'). Click on the following link for examples from the life of Friedrich Nietzsche. Author and acknowledgements: This software was inspired by reading Richard Tarnas's book Cosmos and Psyche, and was developed by Peter Meyer in March-July 2010. The Moon was added in April 2011. Ecliptic longitudes have been validated by comparison with the JPL Horizons ephemerides. Longitudes of the Sun and the planets from Mercury to Neptune are calculated using a translation into C by Peter Meyer of FORTRAN routines which were originally written by astronomer Robert van Gent based on algorithms given in P. Bretagnon & J.-L. Simon, Planetary Programs and Tables from -4000 to +2800 (Willmann-Bell Inc., Richmond, 1986).